I ran the frigging race! Those that follow me know I have had some issues lately that prevented me from running like I wanted and at times from running at all, to the tune of four surgeries in the last 14 months and a persistent hip injury that lasted even longer. Long story short, I finally took a real break (usually I fake it - I know...) and then after my last surgery I came back very, very s l o w l y. And so far it's working! 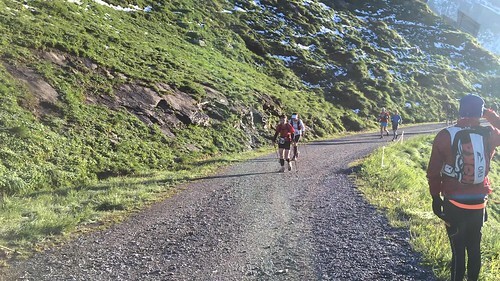 After running the trails for the first time on 30 May I started to log progressively longer and longer runs every weekend which culminated in a tough 26 mile route on 24 June and then running the Needles 50k course on 2 July. Up until this time I had fully resigned myself to not racing. Now, with two weeks to go (perfect taper anyone?) my mind started working overtime and it seemed like the only decision I had to make was whether to run the 51k or the 101k. One week later I decided to go all in. When was I coming back to Switzerland after all? And this event sells out in a hurry, who knows if I would get in next time. Green light baby. I ended up running the entire course with my friend Martin de Vrieze. A couple of days before the start I tentatively asked him if he would be up for this knowing full well that running with someone can often include loads of baggage, especially if your paces are not the same that day. To his credit he said we should give it a go. Martin is fitter than I am. He's been running regularly and I have not. But for some reason during the first half of the course I was feeling super and had to wait for him a couple of times. Turns out this was "money in the bank" so to speak because during the second half I came this close to quitting and it was Martin that waited for me and encouraged me to keep going. And in the end I rallied and we finished really strong actually racing the last 6k! Thank you very much Martin. Some times the weather cooperates and sometimes it doesn't. The weather for this race was (in my humble opinion) the best it could have possibly been. When we showed up in Grindelwald it was rainy, foggy, and I'd be lying if I said I was not a little scared watching fresh snow accumulate in the mountains. The circulation in my hands is not what it used to be and when my fine motor skills go out the window, it's that much harder for me to stay on top of nutrition, etc. At the pre-race meeting they recommended putting spare shoes and socks in your drop bag because, "you WILL be running through snow for 2-3 hours..."
Then came Friday night, and it dried up, and the stars came out. Hallelujah. We walked to the start with jackets but before the gun went off I was down to a short sleeve shirt. It was NOT cold. And the snow? OMG was it fun. Certainly some people did not share my enthusiasm but for me it was a blast. 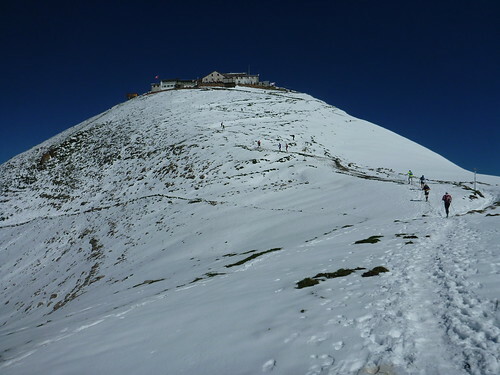 There was about 2' of fresh, pristine white snow on the ground at the highest point of the race but it was not hard to climb through. Especially since the leaders had done all the plunge stepping for me. :) And descending in the snow was a kick in the pants! You could not help but slide around so embracing this and running/skiing down the trail was the way to go. Some people were terrified of slipping or falling (there were sections with exposure) but confidence sometimes breeds success and I had the biggest smile on my face the entire time. To top it off, my shoes hardly even got wet so I never changed them. And lastly, in spite of some heat, it never got up to the boiling point. It was just great throughout. So much so that at the midpoint I "cheated" and ditched my leg warmers, waterproof overmits, hat, spare headlamp and thermal top. I did keep my buff, gloves, rain jacket and long sleeve shirt. ASIDE - I put "cheated" in quotes because some of the elites started with teeny, tiny packs that never could have held all the required gear. Whatever. About 78 km in Martin and I were at an aid station sitting on a bench. My guts had gone sideways about 15 km ago and although I didn't get sick, I was having real trouble consuming anything and was running on empty. There was a train station RIGHT THERE and it would have taken me all the way back to within four blocks of our apartment. At one point I actually told Martin I was going to quit. To his credit he did not reply right away. When he did it was to urge me to just make it to the next aid station. I don't even know if I consciously changed my mind but suddenly we were walking and then we were jogging and then it was too late to turn back. 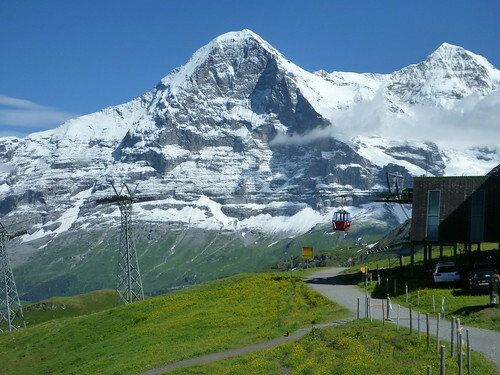 Through the next aid station I still could not eat anything of substance but what saved me was the Eiger Glacier. It was right above the trail as we traversed the mountain and every time we crossed some run off I stopped and drank. Deeply. No calories but I re-hydrated myself in short order and the water was delicious! It slowly helped my stomach settle and about 10 km from the finish I was able to start sipping my Perpetuem again. 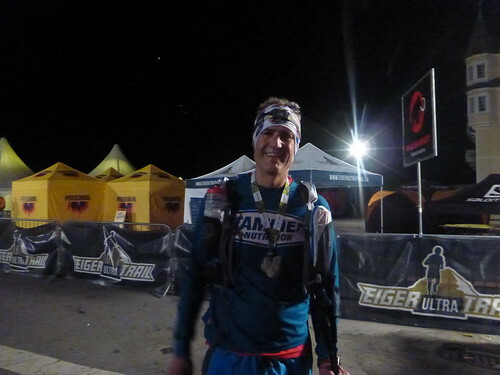 By the time we got to the last aid station I was right as rain and we absolutely ripped the final descent and the flats to the finish passing and dropping more than a few runners. What happened? I think my effort level exceeded my fitness on this day. There have been a couple of other times when food was not appealing to me but this was the worst. So glad I was able to turn it around. Aside from foods, my previous formula for a successful ultra has been to carry a camera. Knowing I will stop to take pictures really lowers my expectations and if there is one secret to success for fragile athletes it's to set the bar super low so you can stumble over it in the dark. I carried one on this day but in spite of not having any mental baggage it was not enough. 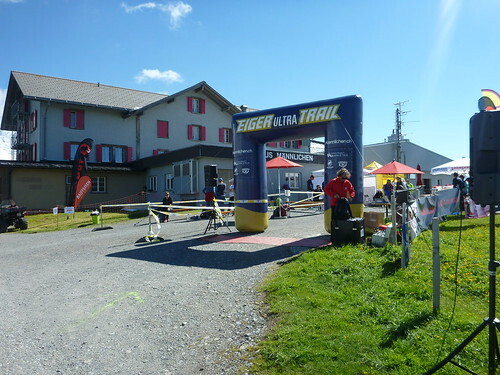 At about 60 km there was an aid station which offered free massage. I went for it. Not only did they massage my legs, they cleaned them up first! I finished this race looking like I had maybe run through a dry, dirt parking lot whereas others looked pretty grim. Sometimes you need to do whatever it takes. As a bonus, I got to practice my French because the two massage therapists were from the French speaking part of Switzerland. :) Thank you race volunteers! And thank you again Martin for waiting. 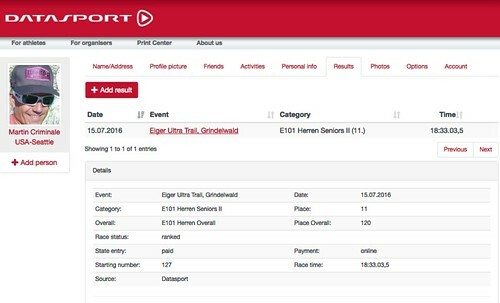 In my opinion one of the biggest liabilities you can have when running an ultra is mental baggage. If your relationship is in turmoil or you are up against a deadline at work you will not be able to get the most out of yourself. Mental strength is key because there will usually be physical highs and lows or other adversity you need to overcome (weather, equipment failure, getting lost, you name it) and being able to do so rationally and with a positive attitude will help and perhaps even save your life. Going in I knew that Shelley thought I was on a pretty accelerated training plan and perhaps not quite ready for the full meal deal. Who am I kidding, she thought I was being stupid. And she was right. But I do like a challenge and in the end she supported my decision to enter the 101k. That made all the difference. And I got lucky. And the fact that Lucca was running this race as well? And that her husband Bil (with one "L") and Shelley met me on the course? And that Martin and I stuck together? So awesome. So empowering! Pretty much every run I go on I entertain at least a small internal debate about what to wear. The longer the run or the more important the event the more significant the outcome of this debate appears to me. Throwing in a required equipment list just ups that anti. All my equipment performed flawlessly. Brooks Cascadia 11 Shoes - I almost went for something a little lighter and I'm so glad I didn't. These really protect my feet from sharp stones, they have good traction, they drain very well and with the sewn in tongue and lacing them all the way up my feet didn't slide forward and thus my toenails are still beautiful. Injinji Socks - No blisters. 'Nuff said. Ultimate Direction PB Adventure Vest 3.0 - Light, loads of room, you can carry two bottles up front (my preference) and you can stow/remove your poles while moving. Everything has its own pocket. Hammer Nutrition Short Sleeve Running Shirt - No matter how hot it got this was comfy. So much so that I never really thought about it/noticed it and isn't that the goal? It also holds less water than any other shirt I own. Did I mention it's super light? Layered with my Hammer sleeveless shirt of my Hammer long sleeve shirt or alone this was all I ever needed. Hammer Perpetuem, Hammer Bars, Hammer Gel, Hammer Endurolytes - I opoted to carry pretty much all of mynutrition. I started with two full bottles and carried four more packets of Perpetuem, four bars and about 10 gels. From the aid stations I took fruit (oranges, bananas, water mellon), some smoked meat and cheese (yum!) and loads of water. Black Diamond Carbon Z Trekking Poles - These are the gold standard. This is my third run with them and it just took me two runs to be convinced they are the bomb. I have a herniated disk in my back and when my core fatigues and can't support my vertebrae it hurts. Using poles my core never gave out. It was a true light bulb moment. I never even got a blister! I only had to stop once to dump a rock out of my shoe, done. What about results? I went in having no clue how long it would take to finish. I have never done a run with this much vertical! Martin had all kinds of formulas and charts and eventually I figured I would be really happy with 20 hours. In spite of all the picture taking, the resting, the massage, the waiting for each other, Martin and I both finished in 18:33. That made my week! How fast was the winner? 11:39. Yep, he was Swiss. The fastest woman finished in 13:09. She's also Swiss. The cutoff was 26 hours and believe you me, people were getting cut. Fully one third of the 600 E101 starters didn't finish. 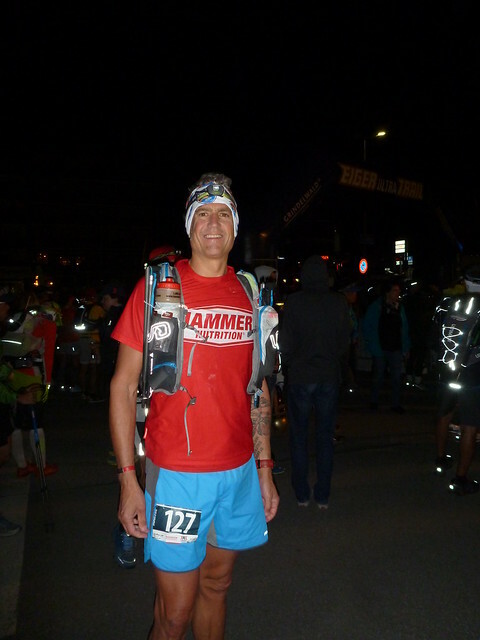 As we walked back to the apartment, and as I showered, and as I lay myself down in bed, I could still see headlamps traversing the Eiger under the glacier 10-15 km from the finish. Respect. I got 11th out of 60 in my age group (Men 50-59) and 120th out of 600 overall. The winner in my age group finished in 14:06(!). Heck, the winner in the Men 60-69 age group finished in 17:51. Nuts. 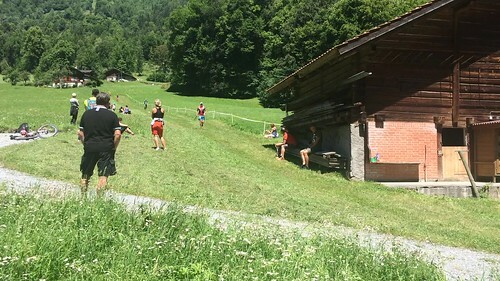 Euli "the Swiss Machine" Steck was there. 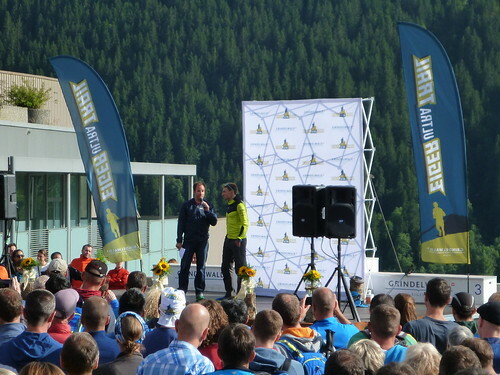 He spoke at the pre-race meeting and said he has climbed the Eiger 41 times! Some have been pretty quick... He also ran the 101k for the first time and did pretty darn well. 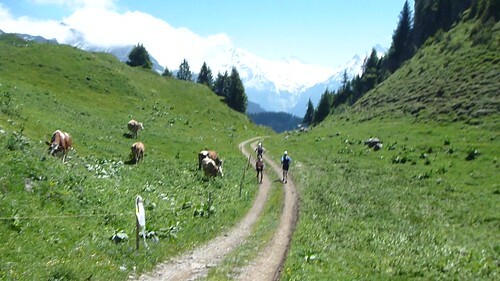 Cows really do wear cowbells in Switzerland and it was the sweetest music ever. I was always looking forward to hearing them. Traversing the Eiger under the glacier we were running through a dip in the trail when I spotted a Rega helicopter (they were everywhere!) parked way down the mountain in a grassy field. There was a guy hanging out of the door and when he looked up and saw Martin and I running toward the ridge he jumped back in and took off. 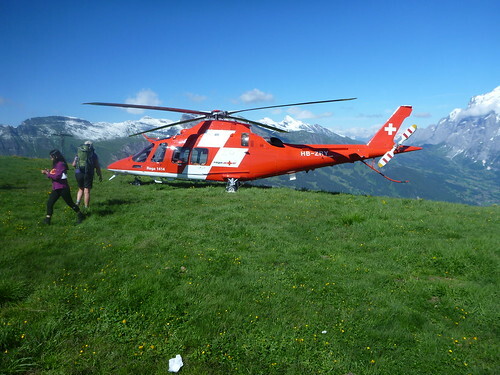 In no time at all the helicopter was at our altitude and then is disappeared behind the ridge were about to crest. In what I imagined looked like a scene from a movie the helicopter sat there behind the ridge just out of sight. I could practically feel the rotors as we got closer and then boom! There it was. The helicopter was perhaps 20' above the ridge line and the camera operator was hanging out of the open side door with a giant bazooka of a lens aimed straight at us. We had to run under the prop wash, I grabbed my visor just in time but Martin lost his hat. Once we were directly under the helicopter it pulled up and away in spectacular fashion. This was supposed to be a 101 km race. But every time I glanced at my watch it read long. At the half way point I was already at least 10 km over. By the finish it said I had run almost 120k! As we were running and at the finish I kept asking other people what their watch said and the average I got for the total distance was about 120 km. Good thing I didn't have my heart set on a specific time. Thanks to all my partners that made this possible! I will treasure the memories. Here are all my pictures and video. They tell the story way better.